With bated breath we had been hoping that we would not get to this point, but it has happened, the last in the 6 week series of Love Your Garden. All gardening eyes were fixed on the TV last night and we would not be disappointed. The tissue box was out within the first few minutes of the show starting and what an emotionally moving show this was going to be. This week’s show came from Bluebell Wood Children’s Hospice near Sheffield. It offers respite care and support for families of children with terminal illnesses. Alan went to surprise bereaved parents Harry and Lisa, Steve and Jane who had been called to the Hospice for a meeting, what a surprise they got! The parents had nominated the Hospice on behalf of other parents who thought that a special garden to celebrate the life and memories of their children who had passed away, would be of great benefit to grieving families. Families were welcome to visit the Hospice for support up to two years after their loss, but had nowhere to go after that. The garden would give all the families a place to go and remember their children. The parents explained how they would like the garden to look and what they would like included. 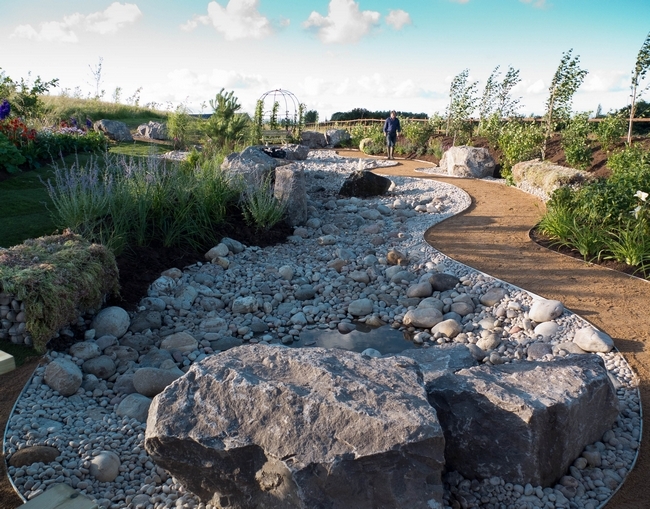 It needed to be low maintenance, a main feature of a dry river bed lined with pebbles, lots of seating and places for peaceful reflection and contemplation. They wanted the garden to be a joyful place to remember their children and wanted to see colourful plants and flowers that encouraged bees, butterflies and garden wildlife. The area the Hospice had allocated for the garden was bigger than anything the team had tackled before measuring 40 x 50 metres. Because of the size of the area, it really did need to be low maintenance, with lots of flowers and bright colours, bringing the wonderful surrounding open countryside into the garden. With the same format as previous shows, that we have grown to love, Alan and his team of David Domoney, Francis Tophill, Kate Rushworth, David Dodd and his team, got started. This was to be an epic makeover with mechanical assistance needed from diggers to achieve the end result that would be the final pièce-de-resistance of the series. While the team got to work on the dry river bed, Alan visited Lathkill Dale near Bakewell in the Peak District, a four mile stretch of river which displayed Mother Nature at her best. The sound of the running water gave the visitor an overwhelming calming feel, flanked on one side by meadows full of wild flowers and on the other by tree covered hillsides. The tranquil feeling that the planting gave needed to be re-created back at Bluebell Wood. The creation of the dry river bed was a huge task in itself to reproduce. 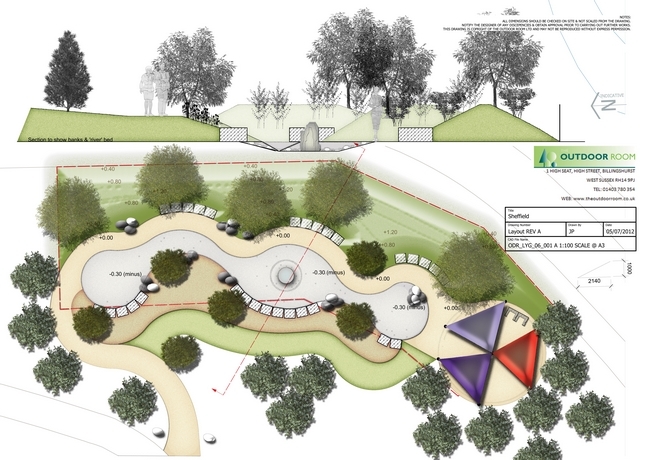 Once the diggers had scrapped away the topsoil, a weed proof membrane was laid down along with a flexible edging strip to hold the stones in place and to give the dry river bed contours which related to the undulating land they were working on. A variety of stone sizes were used to replicate a natural river bed, mixing them up as they would appear in the wild, ensuring that similar coloured stone was used. Big rocks were added to the edge of the dry river bed, grouped in twos and threes for maximum impact along with 25 tonnes of boulders added to help re-create the scene that Alan had seen in Derbyshire. A very large stone was pre-drilled and added to provide a water feature. The parents had asked for plenty of colour in the garden. Francis visited RHS Wisley where Head Gardener, Colin Crossly guided Francis around the gardens while she gleaned ideas for the wide boarder planting at Bluebell Wood. The beds at RHS Wisley were full of colour and had been planned by the “Succession planting” system. This is where when one plant dies off another is ready to pop through the soil and flower, keeping colour in a border over a number of months. The beds looked wonderful, planted in swathes of Varonicastrum, Salvia, Echinacea, Sea Holly, Feather Grass and Dogwood which will give winter colour from its richly coloured stems. The weather during the build was not at all kind to the team. A number of times it was thought they would have to stop working on the garden because of the continuous heavy rain. Walking on wet soil damages its structure and as the soil on the site was heavy clay, 40 tonnes of top soil was barrowed on to the site to enrich the land enabling the plants’ survival once they had been planted. Eventually there was a break in the weather, the team with a number of willing volunteers from the Hospice got to grips planting some of the 800 plants, which included a new Hardy Gerber and a mix of the plants they had seen at RHS Wisley. Twenty-four trees including Silver Birch, Buddleia and Dogwood were planted on the raised areas beside the dry river bed path. Other features added to the garden included secluded wooden seating, sheltered by pergolas and trained Honeysuckle, and Gabions, steel lattice work cages filled with stone and topped with Sedum plants to give a living cushion to sit on. A BBQ area with coloured sails for the canopy, brightened the area and gave a focal point for those families wanting to stay a while and meet friends they had made, whilst caring for their children at the Hospice. This really was now a place for families and everyone from the Hospice to celebrate the lives of the children, to meet, talk and share their experiences and memories. To make the garden more personal Alan presented pebbles to the parents with their child’s name engraved on. The pebbles could be placed wherever they wanted within the garden to remember them. It reinforced Alan’s belief that gardens can give hope and happiness to all. Tuesday nights will not be the same without Love Your Garden which attracted an impressive 4.3 – 4.8 million viewers in this series. Until a new series hopefully comes back round I might actually have to spend a bit more time loving my own garden, and putting some of the inspiration ideas from this series into practice!